When enjoying a beer the first sense that is engaged is vision. The look of a beer says a great deal about it before you take the first sip. Be it a thick opaque porter, a clean and clear pilsner, or a hazy hefeweizen the look of beer often communicates what is coming. It can be the classic and inviting cascade of a nitro infused Guinness or it can be overly pale yellow of a Rolling Rock; each says something important. But what happens when you play against type? 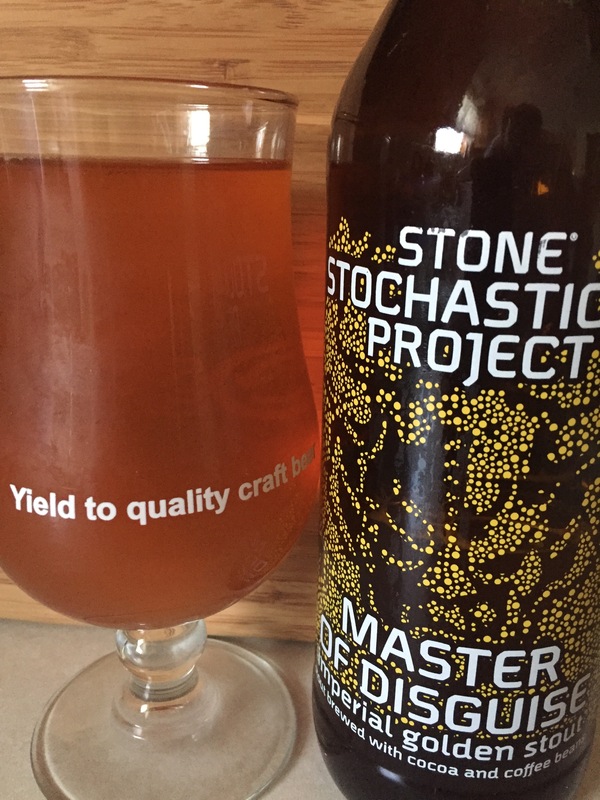 Stone Brewing Company through its Stochasticity Project released Master of Disguise an Imperial Golden Stout. A beer brewed to have the flavor, body and character of a stout but the golden hue of a pale ale. The beer came in a 22oz bomber and I poured it into a stemmed tulip glass. It was as clear and as crisp looking as a golden pale ale; it looked just as advertised. The head was thin and disappeared quickly. The nose is immediately of coffee but it is not overpowering. It is joined by slight, gentle notes of chocolate and roasted malts. The mouth feel a bit deep not unlike a stout but closer to a full bodied porter. This comes from an abundance of oats. The oats show as the backbone and balance all the flavors and allow the beer to lace beautifully along the glass. While it starts with roasted coffee and malts, as the beer warms up the esters of the hops open up. The finish is proper with coffee and cacao flavors lingering. This well balanced beer clocks in at 9.7% ABV but this is never is evident. While the trend of Black IPAs took off and was hot before burning out, I don’t see this beer as starting a trend. It was certainly a delicious beer and an interesting experiment in brewing; it just does not have the complexity and the essence of the other very highly regarded Stone Brewing stouts. Is this “essence” lost when you change the natural color of a beer? If I had enjoyed this beer in a blind test I feel like I would not have guessed it as a stout. There lacked a certain velvet and silk like quality that you get from a full bodied, thick stout…but this was damn close. So the real question is… Did they pull it off? I think so. While the body was a little light, the beer had plenty of stout characteristics to pass. I would recommend this beer for novices that are put off by the concept of a thick black stout. Some people can’t get past the look of a stout beer and tend to just order perceived lighter fare. Master of Disguise would be a great way to introduce imperial stouts. Postscript: I think Master of Disguise is just another in a long line of beers that are blurring the line of what it means for a beer to be “true to style.” Black IPAs drove this conversation for a long time but as they faded from interest so did the discussion. This beer alone will do little to reignite the debate. The boarder question is “How committed are brewers to being true to style?” In homebrew competitions and beer festivals of note this is a critical component. But how important is it to the typical craft beer drinker? As the industry moves further and further outward via expansion how far will brewers push to make something new? I don’t know the answer to that question but I am looking forward to thinking about it while trying a ever changing number of strange brews.